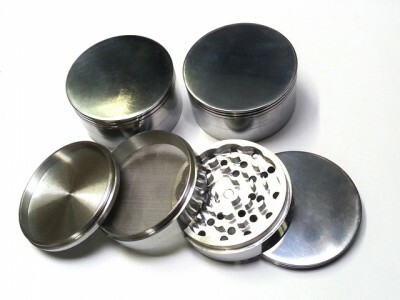 These metal grinders come equipped with metal teeth designed to grind your herb into refined pieces. The grinder comes with 4 separate attachments, each of which can be taken out and cleaned or scraped for built up residue. 2Parts Acrylic Grinder 100 Ct.
4 PARTS 53MM METAL COLOR GRINDER.. Beautifully designed and engineered this metal grinder includes a catcher and filter screen. These metal grinders have continued to be a top seller do to its durability, quality, and timeless style.Size: 42mmMaterial: MetalDiamond teeth4 Parts grinder.. Beautifully designed and engineered this metal grinder includes a catcher and filter screen. These metal grinders have continued to be a top seller do to its durability, quality, and timeless style.Size: 63mmMaterial: MetalDiamond teeth4 Parts grinder.. These metal grinders come equipped with metal teeth designed to grind your herb into refined pieces. The grinder comes with 4 separate attachments, each of which can be taken out and cleaned or scraped for built up residue.Size: 80mmMaterial: MetalDiamond teeth4 Parts grinder..